AI-driven continuous testing for continuous delivery. Unified automation testing tool to automate end-to-end testing for web, mobile apps & APIs. No setup & coding skills required. Testsigma doesn’t depend on the application availability to start automating your testing. Testsigma uses simple natural language to write automated tests right from the design phase. No setup & coding skills required. Run your tests continuously on thousands of OS/Browser/Version combos and real mobile devices available on cloud. Select any browser or mobile device to run your tests continuously. Run all your tests in parallel on Testsigma Lab to reduce the feedback time by many times. Select any number of devices to distribute your tests for faster feedback. Share the feedback immediately with your development team to start fixing bugs, if there are any. Testsigma automatically notifies all the stakeholders immediately with actionable feedback for appropriate action. 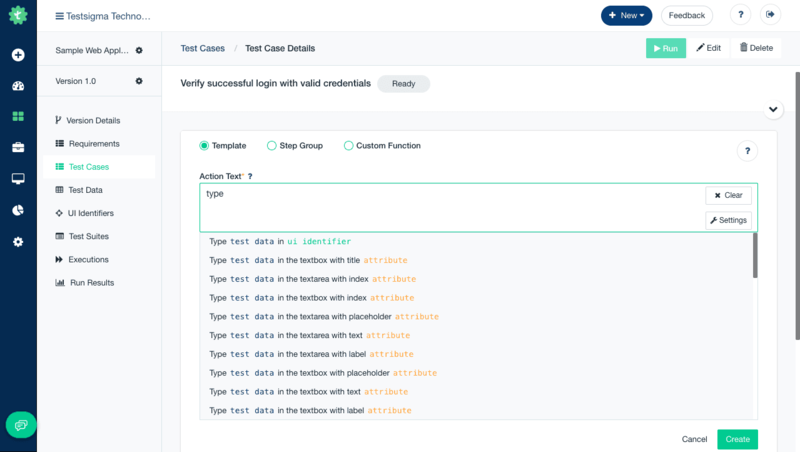 Integrate all your test executions with your favorite CI tools to trigger test runs automatically once the build is ready. Help you put test automation also part of delivery pipeline automatically. Testsigma’s simple natural language approach allows all your SMEs, QA Analysts, Automation Testers, Developers and other stakeholders to collaborate and contribute to automation testing. Testsigma uses AI to automatically include relevant or affected test cases to run when application changes, uses dynamic locator strategy to save maintenance time and efforts by 70%. Also, Testsigma uses AI to identify potential failures upfront to save execution time and cost. Activity, history of your tests.